Hi Dennis! It’s a pleasure to be doing this interview with you. Thanks! Let’s get started! How did you join LucasArts? I actually started at LucasArts in 2000, after working as an intern and scoring assistant on the Scoring Stage at Skywalker Sound. I learned so much while I was there, and fell in love with the Lucas companies all over again…. but this time as an employee. After working for about a year, a position in game audio opened up at LucasArts, and I jumped at the chance. Having been a huge gamer all of my life, it was a great opportunity for me… and I think my love for film sound is something that they were looking for, as production value in games was becoming really competitive. I started as an assistant, working on titles like Bounty Hunter and Obi-Wan. Two and a half years later, I was rewarded with my own project as an Audio Lead. I’ve been lucky enough to work on Star Wars for over a decade now. You are currently the lead sound designer and voice director with the video game division. What does an average work day look like? Great question! One of the things that I love about working for LucasArts is the variety of creative tasks that I’m able to do. In 2010, I got to voice direct Monkey Island 2, LEGO Clone Wars, The Force Unleashed II, and Star Wars: The Old Republic. So my morning may start out with a voice-over session with a talented voice actor, either in person or via phone)\. From there, I’ll go to a staff meeting, maybe answer some e-mails, and then head to lunch, where I’ll have an engaging and geeky conversation about game audio, film, level design, etc… and then head back to my desk. My office is a sound mixing and design suite, and the afternoon is usually when I’ll start the creative energy going: I was fortunate enough to be the mixer on all The Force Unleashed II cinematics, as well as a couple of really awesome trailers. And then maybe late in the day I’ll sit down with our great marketing folks and talk about an upcoming interview, etc…. much like the one we’re doing now! Most fans will know you as PROXY; the droid from The Force Unleashed. How did you get this voice acting part? That’s kind of a fun story. My role on The Force Unleashed was that of the Audio Lead, which is responsible for every sound that comes out of the speakers. That means Sound design and effects, music, and voice-over. Well, for this game we knew we wanted to utilize ILM for likeness capture and motion capture, so we set about casting “theatrical” film and TV actors for the lead roles. My boss, Darragh O’Farrell, was the casting and talent director for that game, and I was assigned to read across from every actor that auditioned for every role! As a result, I traveled quite a bit, and read with dozens and dozens of actors. One fortuitous thing that happened however was that the concept art for Starkiller was approved and I looked at it and immediately thought of my good buddy Sam Witwer. It looked just like him! Sam and I had been friends for years, and his career had just started taking off with Battlestar Galactica and Dexter, so I slipped his headshot and demo reel into the casting pile. I didn’t tell anyone on the team that I knew him. Well, Sam was BRILLIANT in the audition, and was immediately the team’s first choice. I got to read across from him quite a few times. That was fun! 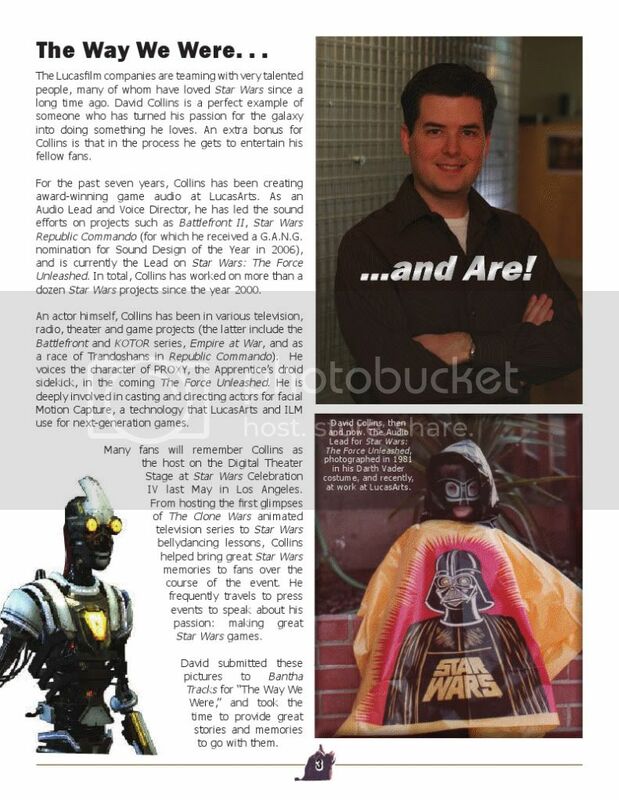 As we approached the initial mocap shoot in February of 2007, we were still missing a few characters (we didn’t prioritize their casting because they weren’t going to be captured), such as Darth Vader, and PROXY. The team was still struggling for a direction with PROXY, and most actors read him in a very creepy way, which was not the team’s vision for the character. When we got to rehearsals, I continued my role as the person who read all of the “other parts.” In this case, I read for PROXY, Darth Vader and Bail Organa. This was before we got Jimmy Smits, who we shot a few months later. When I started reading as PROXY with Sam, the room lit up! People were giggling, smiling, and it just…. worked! I kept reading him throughout the shoot, and it just stuck. We continued interviewing other actors, and finally, by summer of 2007, I was officially given the part. They just loved how it turned out, and that’s how it all came to be! I like this story, because I can’t help but think that my chemistry and friendship with Sam came through in the read… and I like that by helping him land his part, it came back around and gave me an opportunity to play PROXY. I’ll always remember The Force Unleashed very fondly, in no small part because of that exchange. How did you create PROXY’s voice? Were you inspired by something or someone? Funny: I’ve never thought about this. I just kind of naturally showed up to the table read in February of 2007, and that voice came out. If I had to pinpoint it, I would say that it came from years of listening to sci-fi characters like C-3PO and Data from Star Trek: The Next Generation, but the actual sing-song and tone that I gave it most likely came from a play I toured in college. I played a monk named Juniper who was very loyal, very sweet, and like PROXY, prone to mischief due to his simplicity. The effects process adds a lot, of course. PROXY has a vocal effect that almost sounds like there are multiple voices in his head… this was done to emphasize that PROXY is a holo-droid, and most likely has millions of voices in his programming. The story of The Force Unleashed got a very positive reception. What do you think about the storylines of both The Force Unleashed I and II? I loved the story. The idea of giving Darth Vader a secret apprentice has always appealed to me. I was lucky enough to be included in some story workshops on the first one, and got to do a large portion of in-game dialogue writing on the second one. Like a lot of Star Wars fans, I find the dramatic possibilities surrounding clone technology fascinating: so many opportunities for great stories. I’m glad we got to go to Kamino for The Force Unleashed II. And we just found out today that The Force Unleashed II received a Writer’s Guild Award Nomination! In which way(s) is George Lucas involved with your work? Does he give you instructions on how he wants things to be done for instance? George is deeply committed to LucasArts, and is very encouraging of the work we do. But George is also a filmmaker at heart, and a very busy one at that! The continuity of his products is extremely important to him… so much so that he has a whole group within Lucas Licensing that provides continuity and feedback notes to us on a weekly basis. We work very closely with all of the Lucas companies, and the collaboration is really rewarding. Were you a Star Wars fan when the original movies were released? Do you remember when you saw your first Star Wars movie and what you thought of it? Was I EVER! The original Star Wars films literally defined my childhood. I honestly credit so much of my early creative influence to Star Wars. It’s always been a huge part of my life. 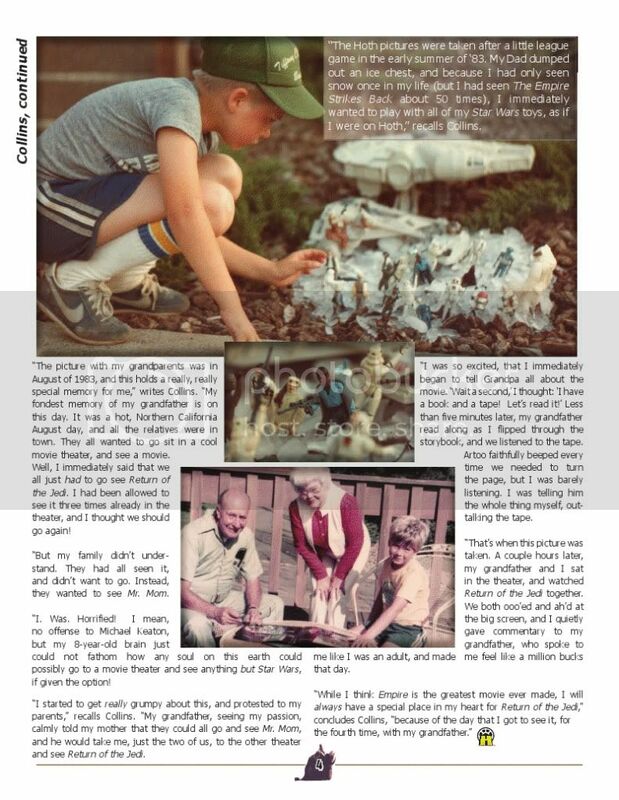 Several years ago, I had a story that appeared in Bantha Tracks about a trip to see Return of the Jedi with my Grandfather…. So many important and awesome memories. Are you involved in the upcoming Clone Wars LEGO game? Could you tell something about this game? I’m definitely involved in the upcoming LEGO game. In fact, I just did an interview on G4 about it. LEGO Star Wars III is all about the Clone Wars, and features episodes from the first two seasons of the Clone Wars, as well as scenes from Attack of the Clones. It is by far the biggest LEGO Star Wars to date… I love it! I’m really excited for fans to get their hands on it… it’s been a blast to work on. What are you currently up to at LucasArts? And are there new Star Wars games in the works we don’t know of? There are always new titles in the works… unfortunately, I can’t spoil the surprises! Right now I’m finishing up LEGO Star Wars III, and planning for the future…. Besides working for LucasArts, you worked as the contemporary music director at the Presbyterian Church of Novato in California. Can you tell something more about this job? I did it for about four years. What a great group of people! I am a musician and I gig pretty regularly. In fact, I have a band called SwingSet that is about to finish its first album. What would your ‘Star Wars dream project’ look like? In a lot of ways, working on Republic Commando, Battlefront II, LEGO, and The Force Unleashed series have been “Star Wars dream projects.” I feel so lucky that I’ve had the opportunity to contribute to Star Wars, and make my creative mark on the franchise. Of all the things you have done so far at LucasArts, what do you regard as the highlight of your career? Boy, it’s hard to pick! As I mentioned above, I’m very proud of the projects that I’ve worked on as an Audio Lead, Voice Director, Sound Designer, Actor, etc. Republic Commando is one of the most special creative experiences of my life. How cool that those characters have found their way into the Clone Wars! And working on The Force Unleashed was an experience that I will cherish for the rest of my life. What a treat to make Star Wars with your closest friends. And the TALENT that I’ve worked with! From designers, engineers and artists, to musicians, sound designers and voice actors… I’ve gotten to work with and learn from the best of the best, and I’m so happy for those opportunities. I’ve also had some wonderful opportunities to share my enthusiasm for Star Wars with fans at conventions like E3, Gamescom, and Star Wars Celebration IV and V. This past summer I got to sit and interview Ben Burtt. What an amazing influence he’s been all of these years. I’ve also really enjoyed working on the Monkey Island and Thrillville franchises, as well as working with other divisions like Skywalker Sound and LucasFilm Animation. LucasArts has been so good to me, and I’m happy I’ve been here for over a decade doing what I love. If I wasn’t here, I’d be at home playing LucasArts games anyway, so I’m glad they put me to work!